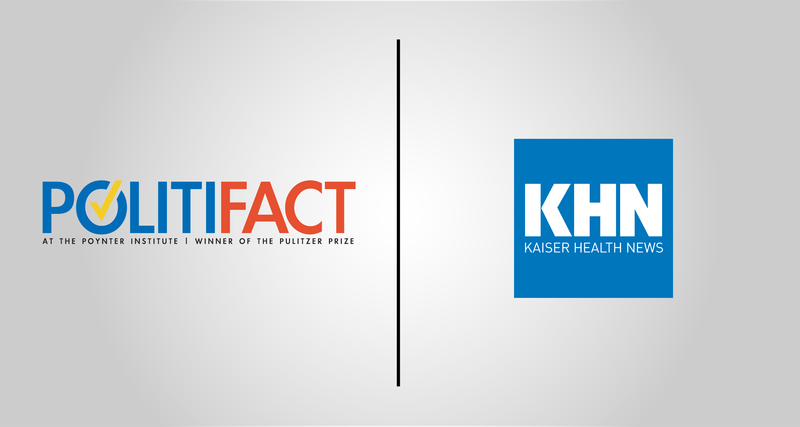 By Josie Hollingsworth on Tuesday, April 2nd, 2019 at 10:00 a.m.
PolitiFact and Kaiser Health News (KHN) have joined forces on health care coverage in an exclusive new fact-checking partnership. Under this initial two-year partnership, both organizations will produce and publish health-related fact-checks on a new co-branded digital channel that will be accessible from either politifact.com or khn.org. PolitiFact and KHN anticipate publishing health-related fact-checks beginning later this spring. PolitiFact staffers will train and work with the KHN editorial team to report, write and edit content using PolitiFact’s fact-checking methodology. "Politicians debate health care and invoke research and stats with an authority that may not always be accurate or in context," said Neil Brown, president of the Poynter Institute, home of PolitiFact. "This collaboration between two of the most credible and respected brands in journalism — PolitiFact and Kaiser Health News — aims to help consumers untangle the half-truths often found in the political discourse relating to health care." PolitiFact is the largest political fact-checking news organization in the United States and won the Pulitzer Prize in 2009. National PolitiFact reporters are based in St. Petersburg and Washington, D.C., while news partnerships expand PolitiFact reporting into 13 states and in Spanish-speaking news markets. "KFF has a long history of providing trusted information on national health issues. This collaboration brings the knowledge and experience of KHN’s team of journalists together with the established and trusted PolitiFact approach to help the general public, policymakers, and other news organizations sort through the misinformation and disinformation that often permeates political and industry discussions of health policy issues," said Drew Altman, KFF’s CEO and KHN’s founding publisher. "We are thrilled to be working with Poynter and PolitiFact on this joint effort." The Poynter Institute for Media Studies is a global leader in journalism education and a strategy center that stands for excellence in journalism, media and 21st-century public discourse. Poynter faculty teach seminars and workshops at the Institute in St. Petersburg, Florida, and at conferences and organizations around the world. Poynter is the home of the Craig Newmark Center for Ethics and Leadership, the Pulitzer Prize-winning PolitiFact, the International Fact-Checking Network and MediaWise, a teen digital information literacy project. A source of trusted information on national health issues, KFF (the Kaiser Family Foundation) is a nonprofit organization based in San Francisco, California. KHN is an editorially independent program of KFF, which is not affiliated with Kaiser Permanente. KHN is the nation’s leading and largest health and health policy newsroom, with more than 50 journalists and dozens of freelancers producing stories that run on khn.org and that are published by hundreds of news organizations across the country.